These acrylic stands provide the perfect riser for computer software, cell phone boxes, games and more. These countertop easels are commonly seen in retail stores to elevate featured merchandise to a more ideal viewing angle. 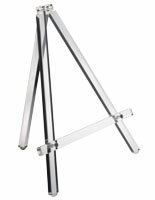 These easels, acrylic stands, are also very popular in specialty shops such as furniture and sporting goods stores. 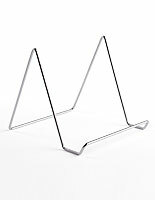 These slanted countertop easels are intended to hold small objects at a relatively tilted angle. 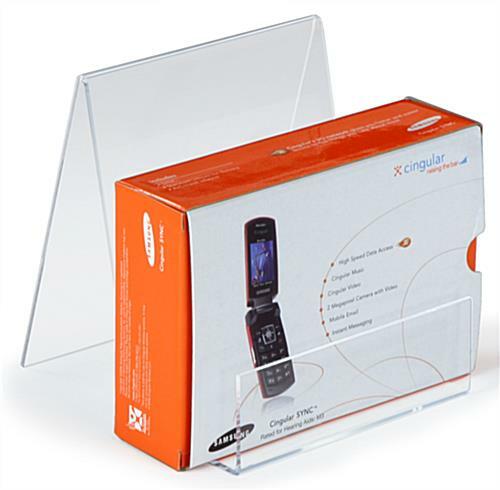 The clear design of these acrylic stands provides an unobstructed view of the entire contents being displayed. Each of these easels is made with one solid sheet of acrylic. 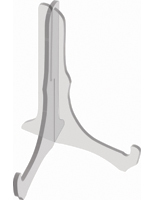 These acrylic stands are seamless which makes them less likely to crack or break. 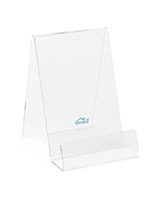 Keep merchandise and props looking neat and organized with these clear plexiglas risers. These acrylic stands hold books straight up for better viewing of the showcased product. Create a multi-dimensional merchandising display with the use of these risers. 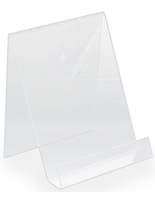 These Lucite easels, acrylic stands are made out of clear plexiglas with polished edges. A 3" deep front slot with a front lip keeps products securely in place. 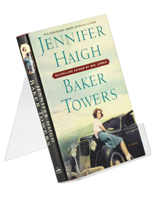 These acrylic stands are an economical way to display boxed products or books. Do you need a custom size? Do you want to buy these acrylic stands with a silkscreened logo on the front? Please contact one of the call center agents for more details.